Educator could combine the video with other resources that document changes in the Arctic with scientific data. On Banks Island in Canada's High Arctic, Inuit hunters have a close relationship with the natural world. They have observed changes in the permafrost, the fish harvests, and the landscape. Their observations of changes over the decades provide an important source of climate change data to scientists who study the Arctic. Comments from expert scientist: Concepts are clearly described, vocabulary is appropriate for the lay person. The problem with using oral tradition is that scientific evidence are not presented. 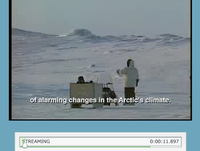 Resource was originally part of an online exhibit from The Smithsonian Institution on climate change in the Arctic. Exhibit is no longer available on the SI site. MS-ESS3.C1:Human activities have significantly altered the biosphere, sometimes damaging or destroying natural habitats and causing the extinction of other species. But changes to Earth’s environments can have different impacts (negative and positive) for different living things. MS-LS2.C1:Ecosystems are dynamic in nature; their characteristics can vary over time. Disruptions to any physical or biological component of an ecosystem can lead to shifts in all its populations. MS-LS4.D1:Changes in biodiversity can influence humans’ resources, such as food, energy, and medicines, as well as ecosystem services that humans rely on—for example, water purification and recycling. HS-LS2.C2:Moreover, anthropogenic changes (induced by human activity) in the environment—including habitat destruction, pollution, introduction of invasive species, overexploitation, and climate change—can disrupt an ecosystem and threaten the survival of some species. HS-LS4.D2:Biodiversity is increased by the formation of new species (speciation) and decreased by the loss of species (extinction).